Tonight The Walking Dead returns with a whole new episode called ’Better Angels.’ Stay tuned as we live blog the show with all the up-to-the-minute results. On last week’s episode Dale was killed by a Walker which could have been avoided if Carl hadn’t baited the Walker after stealing Daryl’s gun. If you missed last week’s episode you can read our full official recap HERE. AMC has let it slip on their website that Shane is leaving the show, will it be tonight? Or, will they leave it for the final episode next week? How do you think AMC will get rid of Shane? Check out the major spoiler here! Remember last week when Carl stole the gun and played cat and mouse with the Walker? Well, this week we released another major spoiler where his dad Rick gives him a gun. You can read all about it and watch the video HERE. We will be live blogging the show with all the up-to-the-minute details at 9PM EST so make sure to come back to this spot and watch the show with us. Refresh often to get the most up-to-date results! RECAP: They open up tonight’s show with Dale’s funeral with Rick giving a speech. Shane, Daryl, Andrea and T-Dog head out in the pickup and find some Walker’s having a picnic with a cow’s remains. They get out and kill all the Walkers. When they return to the farm, Hershel announces that everyone should move into the house. Andrea is worried about patrol but Rick has a plan for everything. Hershel tells Rick he has no more patience with Shane but Rick tells him that he’s turned over a new leaf. Rick tells Andrea that he wants her to watch over Shane, he wants to make sure every time he leaves the farm all hell doesn’t break lose. Shane finds Carl wondering around, he wants to confide in Shane about something and he doesn’t want his parents to know. Carl hands over Daryl’s gun to Shane that he stole. Carl goes on to tell Shane that it is his fault Dale died, he had met with the Walker earlier in the day and didn’t shoot it even though he had Daryl’s gun. Shane assures him that it was not his fault and tells him to keep the gun to protect himself but Carl doesn’t want it and walks away. Shane heads over to the wind tower and starts making some repairs. In the house, Maggie offers for Glenn to put his things in her room, outside T-Dog helps Lori bring things into the house. Hershel tells Lori she is taking the bed being as she is pregnant, he will take the couch downstairs. T-Dog and Hershel head into the house, Lori notices Shane up on the tower and asks him to come down. She tells him that after Sophia, she thought they would heal somehow, but after Dale, it just keeps coming. She goes on to say that she made a mess of things, put Rick and him at odds, she doesn’t even know whose baby she is carrying. No matter what, she realizes that Shane was there for her and she is sorry. Rick and Daryl are at the house when Shane drives up, Daryl goes into the house for a piss. Shane tells Rick that Carl went to see him, he tells Rick the story about the Walker and Carl. Carl says that he will have Lori speak to him and Shane says that he thinks Carl wants to speak to his dad. Rick tells Shane that he needs to take care of Randall, Shane offers but Rick turns him down. 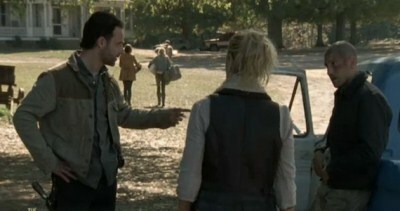 Shane hands Rick the gun Carl stole from Daryl and walks away. meanwhile, Andrea and Glenn are trying to get Dale’s camper going, the two start talking and Andrea tells Glenn that Dale knew how much they both cared for him. Glenn gets the camper going. Rick heads to the barn to have a chat with Carl. He hands him a gun, tells him that what happened to Dale had nothing to do with him. Rick tells Carl, no more kids stuff, people are going to die, there is no way anyone is going to be ready for it but they must try to avoid it the best they can. Rick wishes he had something better to day, Carl finally takes the gun. Shane heads out to the barn where Randall is handcuffed and gagged, he gets up off a stool and points his gun Randall’s head but doesn’t shoot him. Daryl and T-Dog got the pickup packed up, T-Dog heads to the barn to get him and finds he’s gone. Meanwhile, Shane is in the forest with Randall and takes of his gag. Shane wants to know where his group is at, he tells him that it is only five miles away off the highway. Randall is surprised that Shane doesn’t want to kill him. Shane convinces him that he wants to join Randall’s group because he is fedup with his. Randall disappears, we are led to believe that Shane killed him. Shane runs into a tree and scrapes his whole face. All of a sudden, he comes running out of the forest and tells everyone that Randall has his gun and he escaped. Daryl, Glenn, Rick and Shane head out into the woods, but Daryl is already suspicious. It’s dark and they are still searching for Randall, they split up in two groups, Daryl and Glenn vs. Shane and Rick. Daryl has a flash light, he finds tracks, something weird went down. All of a sudden, Daryl and Glenn are startled by a Walker. Glenn kills it and they are both shocked to see that it is Randall. Daryl inspects the body and finds that there are no bite marks, they are both shocked and wondering how that can be possible, further inspection reveals that Randall dies from a broken neck. Meanwhile, it is not only Daryl that is suspicious, Rick is too and he is not even with them. Shane and Rick are still wondering around, Rick tells Shane it was strange that Randall got out because the doors were still locked when T-Dog showed up. Shane explained that he probably got out through the roof. Rick finally figures out that Shane took him out in the woods to kill him. Shane admits that he snapped Randall’s neck. He goes on to tell Rick that Lori and Carl will eventually forget him when he is gone and Rick tells Shane that he won’t be able to live with himself if he kills him. Shane taunts Rick, tells him that he is a better father than he could ever be. Shane has his gun drawn and tells Rick to draw his. Rick doesn’t want to draw his gun. All of a sudden, Rick stabs Shane and he hits the ground. Shane is dead and Rick is very upset, he didn’t want this to be the outcome. Out of nowhere comes Carl, he has a gun drawn, Rick gets up and heads towards and tells him that he doesn’t understand what happened. Little does Rick know that Shane turned into a Walker and is right behind him, Carl shoots him dead. The sound of the gun awakens a hoard of Walkers that are now coming towards the house. That’s it for tonight, my heart is still racing, what an amazing episode!